Cholula is unlike any other hot sauce. Our unique peppers and spice blend delivers a robust flavor without a lingering heat and our versatility goes far beyond the everyday condiment. Splash some on a burger, slather on grilled corn, mix some in ranch or even pour over popcorn. 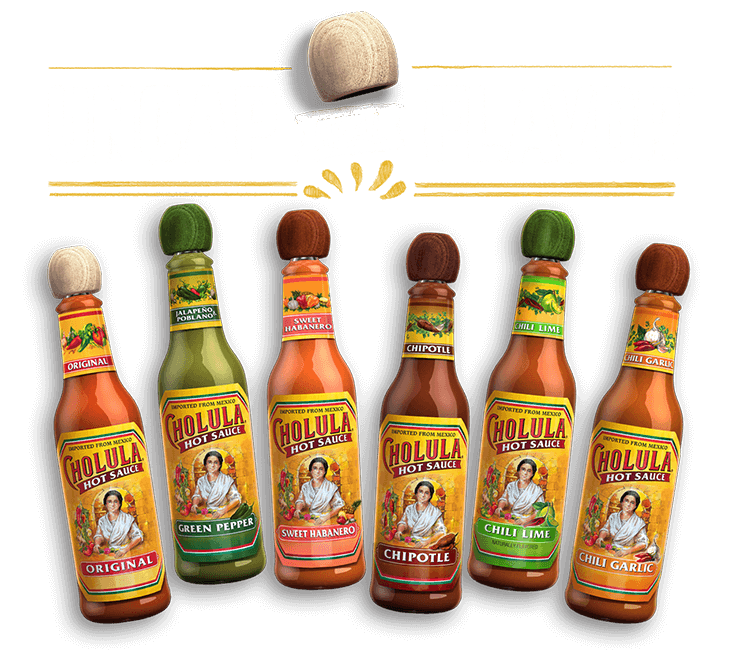 Uncap Real Flavor™ anywhere, anytime on anything. L Catterton, the largest and most global consumer-focused private equity firm in the world, announced that it has entered into a definitive agreement to acquire Cholula Food Company. L Catterton’s acquisition will allow Cholula to become a truly standalone enterprise, and will enable the company to continue delivering on its potential to become a powerful and enduring global brand. WHY IS IT CALLED CHOLULA? We are a brand with a proud Mexican heritage that is now a fixture in American homes and restaurants. To honor our roots, Cholula Hot Sauce was named after a 2,500-year-old city in Mexico, the oldest inhabited city in North America. HOW DO YOU PRONOUNCE CHOLULA? We’ve heard several interesting takes but it’s Choe-loo-la. HOW SPICY IS CHOLULA HOT SAUCE? In 1912, Wilbur Scoville developed a scale to measure peppery punch. Cholula delivers an enjoyable 1,000 Scoville units. For comparison, bell peppers range between 0-100 while habaneros fall between 200,000-300,000. WHERE CAN I FIND CHOLULA? Cholula Hot Sauce is available in stores across the United States as well as in restaurants who know about good flavor. We now also have our products available online so just click the SHOP button at the top and start purchasing! IS CHOLULA HOT SAUCE GOOD FOR MY HEALTH? While we cannot make health claims, research has shown that chili peppers deliver significant benefits such as Vitamin A, antioxidants, acceleration of metabolic rates and may lower blood pressure. IS CHOLULA HOT SAUCE GLUTEN-FREE? IS CHOLULA HOT SAUCE KOSHER? DOES CHOLULA HOT SAUCE NEED TO BE REFRIGERATED? Clear space in your cabinet because Cholula Hot Sauce does not need to be kept cool. Cholula Hot Sauce is best used within the first six months after opening. WHERE CAN I FIND CHOLULA HOT SAUCE DRY SEASONINGS? We are sorry to say that our line of seasonings are no longer available. WHERE CAN I PURCHASE THE BIG BOTTLE OF CHOLULA (64OZ)? The big bottle can easily be purchased on our online store in an assortment of flavors. IS THE CHOLULA BOTTLE AND ITS CAP RECYCLABLE? Cholula has taken every step to ensure that the bottle and all of its elements are recyclable. It is important to note that for the cap, the components do need to be separated from each other in order to recycle properly. Once the plastic cap is removed from the wooden top, the liner must also be removed so the polymer cap can be recycled appropriately. Once separated from other remains, reclaimed wood can be easily crushed to build boards fully useful for building furniture and interior particleboard, at affordable prices for consumers. ARE THERE OTHER WAYS TO RECYCLE THE BOTTLE? There are many other creative ways to recycle the Cholula bottle which include vases, pencil holders, wind chimes, soap dispenser, tiny pet water bowl, or a cap charm bracelet. We love to hear from our consumers on interesting ways the bottle and cap are reused. Stay tuned on all things Cholula with our newsletter.